The Encomium of St Severus upon the Archangel Michael contains some interesting material which is well worth study. An encomium, in this context, is essentially a form of homily which praises a particular saint or angelic being. In this case St Severus is concerned with the Archangel Michael, and his encomium was preached on the occasion of the feast of the Archangel. An encomium on the Archangel Michael was also preached by St Theodosius of Alexandria, and he used the account of St Michael helping the god-fearing Dorothea and Theopista, which features in the Coptic Synaxarium for Hatour 12, the feast of the Archangel Michael. St Severus bases his encomium on a different story altogether, but he also uses it to show how St Michael could be relied upon to come to the aid of faithful Christians. The encomium of St Severus is interesting not so much for the story he uses, which may perhaps be a pious fiction, but for the substance of the teaching which he offers his congregation both at the beginning and end of his sermon. St Severus reminds his hearers of the occasion in the Gospels when the Archangel appeared in the tomb when he gave the news of the resurrection to the women. Then he introduces his story by explaining how it will show that St Michael is truly the great supporter of all faithful Christians. St Severus describes several aspects of the ministry of St Michael. He says that he ‘entreats God to forgive the whole race of men their sins’. That he delivers the saints out of all their afflictions, and strengthens the martyrs. That he is present with ‘those who walk after God with all their hearts’, and that ‘he prays to God that he may be their helper’. Then St Severus proceeds to provide an account of the conversion of a pagan to the Christian faith, and the various trials which he and his family successfully face with the help of St Michael. On every occasion when the converted family faced persecution and even death, St Michael appeared in a visible manner as a nobleman or a general and acted in a manner which saved them. To those who live he gives strength in their time of need, and for those who are dead he prays to God to show mercy on them. Let us give him the things he desires, so that he may stir himself for us on account of them, and that he may love us exceedingly, and may pray to God for us. Perhaps this sounds a little suspicious? What would St Michael desire of us? Does he seek praise and worship for himself? What are these things that St Severus believes St Michael desires of us? They are that we should love one another in the love of God. That we should live in the unity of brotherly love, and that we should avoid the sins of slander and lust. According to St Severus the sin of fornication is one which is greatly hated by both God and his angels. St Severus teaches his audience that it is only with an upright heart that we may entreat St Michael and ask him to pray for us before God. In the final passage of his encomium he insists that it is through the prayers of St Michael and the Holy Mother of God that the world is preserved, St Michael as the head of the Angelic hosts, and the Blessed Virgin as the Mother of the Church. It seems clear that in the pastoral witness of St Severus the figure of the Archangel Michael is most important, even as important as the Mother of God. He can be relied upon as a faithful and powerful intercessor for all faithful Christians, indeed for all men, since he asks for the salvation of all. Yet we may not take his intercession for granted. If we are to benefit from his prayers then we must seek to be men and women of upright hearts and lives, especially in regard to being in a state of peace and unity with our Christian brethren. Here beginneth the discourse of Abba Severus, the holy patriarch and Archbishop of Antioch, in which he shewed forth the compassion of God, and spake concerning the presence of the holy Archangel Michael, and of his love towards man, and how he delivereth men from the snares of the Devil. In it he also spake briefly concerning the holy Lord’s Day now in that year the festival of the holy Archangel Michael happened to fall upon the holy Lord’s Day and he spake, moreover, concerning Matthew the merchant, and his wife, and his son, and of how they believed in God through the prayers of the holy Archangel Michael. This discourse was pronounced on the twelfth day of the month Athor, at the gathering together of the multitude to celebrate the festival of the holy Archangel Michael at his shrine, in the peace of God. Amen. Ye know also, O my beloved, that to-day is the festival of our salvation, the holy Lord’s Day, in which, first of all, it is meet that we should hymn, and bless, and glorify God to Whom all honour is due always, and for ever and ever, Amen and afterwards, that we should direct our discourse to the honour of Michael, the mighty and holy Archangel. Hear ye also Him in the holy Gospel according to Matthew: “The Archangel of God said to the women, hear ye not, for I know that ye seek Jesus Who was crucified. He is not here; for He is risen, as He said to His disciples.” And Saint Matthew saith, “He was like lightning, and his clothing was white like snow,” that was the holy Archangel Michael, the ruler of the hosts of heaven. Let us then keep the feast this day, my beloved, for God is in our midst, and the whole company of the angels keep the festival of the holy Archangel with us, for it is Michael who entreateth God always to forgive the whole race of man their sins. With which of all the saints was not the Archangel present to deliver him out of all his afflictions? and to which of all the martyrs did not the Archangel Michael give strength by God’s command until he received his crown? And now, my beloved, if ye wish to know whether the Archangel Michael be present with those who walk after God with all their hearts, or whether he prayeth unto God that he may be their helper, listen, and I will show you this great miracle which took place through the power of God and through the prayers of the holy Archangel Michael, which is related by men worthy of belief. There was once a merchant whose name at first was Ketson, and he sprang from the country of Entike, and he was very rich and he had there much business; but he knew not God, for he was a pagan and worshipped the sun, and he lived in his heathenism, and God wished to deliver him. And it came to pass on a time that he loaded a ship with his wares, and departed to a city in the country of Philippi called Kalonia, in which they worshipped God alone, and he entered therein on the first day of the month Athor, and stayed there and sold his wares. And when the eleventh day of the month Athor had come, at the time of noon on that day he passed by the shrine of the Archangel Michael, and saw men crowning it with lanterns and draping it with cloth, and he marvelled greatly, and sat down there according to the dispensation of God to see what would be the end of the matter. And when the evening was come he saw that all the multitude was gathered together there, and they lit the lamps and sang sweet hymns of praise; and the man marvelled, and because of his exceedingly great astonishment he slept by the door of the shrine. And during the night the clergy and the law-loving gathered together and performed the service, and the man marvelled greatly at what he heard. And the men said to him, “Thou canst not become like unto ourselves until our Father the Bishop hath prayed over thee, and hath sanctified thee and baptized thee in the name of the Father, and the Son, and the Holy Ghost; then wilt thou have become a Christian. But wait until our Father the Bishop hath a convenient season, and then we will take thee to him, and he will make thee like unto ourselves;” and he did as they spake to him, and he waited that day. And straightway at that moment a voice came to him, saying, “Be not afraid, for no evil shall betide thee;” and immediately the crests of the waves bowed down and sank to rest, and the ship righted herself and sailed along smoothly, and by the command of God the merchant arrived in his own city, and no evil happened to him. And when he had gone into his house he rejoiced with exceeding great joy, and he told his household of the marvellous thing which had happened to him in the ship, and of all that had befallen him in the city of Kalonia. And the Bishop rejoiced with an exceeding great joy at the conversion of their souls, and when they had been brought in to him he said, Do ye in very truth wish to become Christians?” And the merchant answered humbly, “Yea, by God’s will, and by thy holy prayers, O Father.” Then the Bishop caused them to make ready a Jordan in the shrine of the holy Archangel Michael, and he instructed the man, and his wife, and his four sons, and their servants, and he baptized them in the name of the Father, and the Son, and the Holy Ghost. Now the name of the merchant was at first Ketson, but the Bishop changed it, and called his name Matthew, and his wife he called Irene; and he called the first of the four sons John, the second, Stephen, the third, Joseph, and the fourth, Daniel. And he made ready the Communion and gave to them of the holy Mysteries, the Body and Blood of our Lord Jesus Christ. And after their baptism they tarried a month with the Bishop, and he instructed them in the things of their upright faith. And Matthew the merchant, by reason of the exceeding great joy which had come to him, gave six hundred mithkals to the shrine of the Archangel as thanksgiving offering for his salvation. And they received blessing at the hands of the Bishop before returning to their own country, and they bade farewell to the chief men of the city and to the law-loving men with great joy, and by the will of God they returned to their country, being guided and directed by the holy Archangel Michael. And when they had gone into their house they made a great feast for their people, and they distributed great charity to the needy, and widows, and orphans, and their village marvelled at them, and their name was in the mouth of every one; and they made their country to shine by their good deeds. And it came to pass after these things, when two months had passed by, that the excellent man Matthew went to his rest; he had come to work in the vineyard at the eleventh hour, but through the prayers of the holy Archangel Michael he received the wages of the whole day. And his little sons and their mother ceased not from the good things which they were wont to do in abundance while their father was alive. Now the Devil and his friends could not bear to see the good deeds which these holy people were doing, and he stirred up the people of their city against them, and he made them to hate them with a great hatred, and at length they rose up against them and seized their possessions by violence, and the things which were in their store house. Then John said to his mother and brethren, “Behold, ye see how much they have afflicted us since our father died, arise now and let us leave this place, and go to the royal city, and live there; for it is written in the holy Gospel, If they persecute you in one city, flee to another. And behold they have persecuted and afflicted us here; but God’s will be done. So they arose secretly, and took what things remained unto them, and they went into the royal city, and lived there, saying, May the God of the Archangel Michael be our helper; and they multiplied the charities which they were wont to do of old. And again the Devil could not bear it, but was disturbed when he saw these pious people giving their charities in faith now he knew not that the holy Archangel Michael would put him to shame and at length he roared like a lion. And it came to pass that when a few days had gone by, the watchmen of the city went in and robbed the house of one of the chief nobles of the city, and they carried off much booty; and the nobleman told the governor who was over the city, and he made an enquiry into the matter by the hand of the controller of the city, who straightway laid hold of the watchmen and compelled them to find for him the nobleman’s property. And while they were disturbed concerning this matter, behold the Devil took the form of a man, and went about throughout the city, and cried out, saying, “I know who stole the property of Sylon the nobleman, for I saw these four strange young men, who came here a few days ago, go into the house, and plunder it, and we know of a truth that this hath been their business from the time when they lived in their country.” And when the men of the city heard these things they told the governor, and straightway they dragged them along by the hair of their head by the governor’s command, and brought them in before him. And straightway the governor commanded them to take the little child into the house of the chief watchman, as the Archangel Michael had said, and he cried out, saying “In the name of my Lord Jesus Christ and of the holy Archangel Michael, let the things stolen from Sylon the nobleman appear.” And straightway a voice came, and everyone heard it, saying, “Go down into the cellar, and ye will find everything; these young men are innocent of the offence;” and they went down straightway into the cellar, and found all the stolen things. And when they told the governor what had happened he marvelled greatly, and when he turned round to tell him that had taken the form of a patrician, that is to say Michael, what had happened, he did not know where he had gone; and he marvelled greatly. And he set the young men free, and they went to their house glorifying God and His holy Archangel Michael; and these pious people did not cease from doing the good deeds which they were wont to do unto everyone, and everyone marvelled at their good life. And it came to pass some time after these things had happened that a certain man accused two men before the governor of not having paid the debt awarded by a former judgment, and the governor gave the two men over to certain soldiers that they might compel them each to pay one hundred mithkals, but they had not the wherewithal to pay. And it happened opportunely that the good man John met them, and when he saw the soldiers mercilessly driving them along with blows, he said to the soldiers, “For what reason do ye beat these men?” And the soldiers said. “We have seized them because each oweth one hundred mithkals. And John said to them, “Will they be set free if the two hundred mithkals be paid?” and the soldiers answered, “Yea, but if they pay not the money they will be slain.” Then John entreated the soldiers, saying, “Wait a little, and I will come back to you;” and he went into his house and brought out two hundred mithkals and he gave them to the soldiers, and they set the two men free, and he also gave unto each of the four soldiers, who had been set over the two men, a mithkal. And again the Devil, the enemy of all truth, could not bear to see this, and was tilled with envy against the pious brethren because of their good works, and he stirred up a great and exceedingly hard and severe trial, which was this. And it came to pass after these things that a certain man in the city had invited some friends and neighbours into his house now it was eventide and this man lived nigh unto the house of the pious brethren; and when they had eaten and drunk, a certain man rose up to go to his house. And as he was walking across the open ground of the city, a scorpion stung him and he fell down and died immediately, and no man knew what had happened to him. And when the watchmen of the city were going about on their rounds together, they found the dead man, and they brought him into the light, and although they examined the body they knew not what had happened to him; and they made him ready for burial and when it was morning they carried him to the sepulchre. And the Devil, taking upon himself the form of a man, cried out to the whole city, saying, “This wicked murder of the man who is dead the cause of his death and his murderer being known unto no man cannot have been committed by any one except those four strange young men, and I am ready to bear witness to this fact.” And these words spread throughout the whole city, and the general went and told the governor Kesanthos, who straightway commanded and they brought the four young men before him with their hands tied behind them, and chains round their necks. And as they were bringing them before the governor, a voice came to them, saying, “Fear ye not, for behold the time of tribulation passeth by, and peace shall come unto you from God;” and they set them before the governor as condemned criminals. And Michael said to him, “It seemeth to me that if the matter be thus, and that a man hath died, we cannot know who hath slain him until we bring the dead man here in our midst, and we ask him, and he tell us and shew us who hath slain him; so then if thou wishest to know the truth let them bring the dead man himself here, and we will question him, and he will speak to us, and shew us who hath slain him.” And straightway the governor commanded, and they brought the dead man into the midst of them. And the Archangel Michael said unto Daniel the youngest brother of the pious men, “Go, say to the dead man, In the name of my Lord Jesus Christ, the God of heaven and earth, show us what did happen unto thee;” and the child did so. Then God, Who loveth mankind, and Who wisheth to make His holy name glorious in all places, so that men may believe in Him, made the soul of the man to return to his body, and he came to life for the salvation of the governor and of the whole multitude of the people of that country. And the man cried out, saying, “Woe unto thee, O Kesanthos the governor, for thou hast been bold to sit down with the holy Archangel Michael, the general-in-chief of the powers of heaven; and, moreover, these men who have been accused are innocent of the offence, and are just men, for it is not they who have slain me, but the scorpion which bit me, and caused me to die. And it is by reason of the excellence of these men that hath happened unto thee the great blessing that thou hast been deemed worthy to see the holy Archangel Michael. And behold, the marvellous things of God which thou hast seen set thou in thy heart, and forsake these pleasures, and these dead idols in which there is no profit, that God may forgive you the offences of your previous life. And as for me, a great act of grace hath been shewn unto me, for through these just men I have seen the Archangel Michael. And straightway the Archangel Michael went up into heaven with great glory, and the governor and all the multitude saw him go up into heaven, taking up with him the soul of the dead man; and the governor and all they who were with him were in exceeding great fear. And John said to the governor, “Arise, and write to Constantine, : Emperor of the Greeks, and tell him of everything that hath happened; and entreat him to send to us one of the Bishops of your country that he may instruct you in the name of the Father, and of the Son, and of the Holy Ghost.” And Kesanthos the governor wrote to the Emperor Constantine, saying, “Kesanthos, whom men call governor, dareth to write to the mighty Ruler and Emperor, Constantine, the servant of Jesus Christ, sending greeting. A mighty act of grace hath come to us from the good God, Who hath had us in remembrance, and He hath brought us from the service of polluted idols, and hath turned us to Himself by His great and exceeding goodness through the prayers of the holy Archangel Michael, and we have been accounted worthy to see him with our eyes, and he made a dead man to speak with us mouth to mouth, after he was dead, and afterwards he went up to heaven with great glory, and we all saw him. And the Emperor Constantine sent this letter to Abba John, Archbishop of Ephesus, together with the letter of Kesanthos the governor; and when the Archbishop had read the letters he rejoiced greatly at the conversion of the whole country. Then he took with him two deacons, an elder, and a reader, and three singers of Psalms, twelve workers, and he took with him for the stablishing of the altar a golden table, and four cups of silver, three cups of gold, and a cloth made of finest byssus, and a covering made wholly of silk, and the four Gospels, and the Psalter, and the Epistles of Paul, and the Acts, and the Catholic Epistle of St. James, and in short everything necessary for a church; and they prayed and set out upon the road rejoicing. And the Archbishop and the governor went there together, and they looked at the place upon which they were going to build; and it pleased the Archbishop. Then the governor made the herald to cry out through out all the city, saying, “Let every man come, and labour at the building of the church,” and straightway the whole city was gathered together to work at the church, whether it were nobleman, or whether it were poor man, and even the governor himself laboured with his own hands, and everyone believed that he would receive a blessing from Christ. And by the will of God they finished the building in sixteen days, and the Archbishop consecrated the church to the name of the Holy Virgin, the Godbearer Mary. And when the Archbishop saw the great multitude who wished to be baptized, he said to the governor, “Where shall we baptize this multitude?” Now a church with a place for water for baptism therein had not yet been built. And the wise John answered and said to the governor and the Archbishop, “The pool of water which lieth to the east of the city is, I say, suitable for this great honour.” And straightway a voice came from heaven, and everyone heard it, saying, “This is the place, which hath been set apart by God, O John, son of the apostle;” and the Archbishop, and the governor, and all the multitude who heard this marvelled. And the Archbishop and the governor commanded, and all the multitude were gathered together to the place of the pool of water, and the Archbishop prayed over the water on every side of the pool. Now at that time a great and wonderful thing happened, for when the Archbishop came to the consecration the whole multitude heard voices in the water which repeated the consecration with the Archbishop. And when the Archbishop had finished the prayers, he commanded that all the multitude should go into the water, and they all leaped into the water, and cried out, saying, “We receive baptism in the name of the Father, and of the Son, and of the Holy Ghost.” And when the governor and all the multitude had been baptized, the Archbishop took them to the church, and ordained John to be their bishop, and one of his three brethren he ordained elder, and the other two he made deacons. And a son of the governor called Echillas he made deacon, and all the multitude rejoiced in God. Then the Archbishop was careful concerning the Offering, and he laid it up upon the altar, and made the Offering. And the governor and all the multitude marvelled at what they saw and at what they heard, for they had never before heard such things, and they had never before seen the like, for this was the first time that the Offering had been offered up in that country; and when they had all partaken of the Holy Mysteries, the Archbishop pronounced over them the benediction of peace, and each one went to his own house. And the Archbishop tarried with them a month of days, and he instructed them, and taught them the ordinances of the Church; and afterwards lie went to his city with great joy. And Kesanthos the governor, and all the multitude of the city glorified God. and they paid honour unto Saint John the Bishop, and unto his brethren, for they grew in the doctrine of God. And after a few days the holy Bishop said to the governor, “Let us build a church in the name of the holy Archangel Michael,” and the governor said to him, “Do whatsoever thy soul desireth, O our father, for we are ready to listen unto thee.” Then the holy Bishop John laid the foundation of the church, and the whole city helped him, and he finished it with great zeal, and he put on its copingstone in eight months; and the holy Bishop John consecrated the shrine on the twelfth day of the month Athor, in the name of the Archangel Michael. 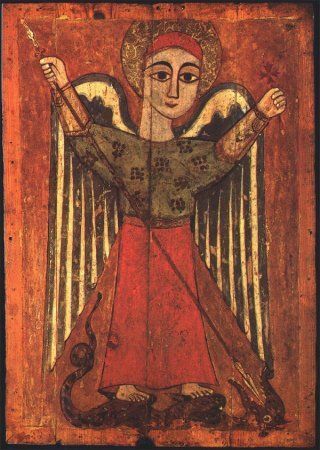 Now this festival of the Archangel Michael was a double one; for it was the festival of the Archangel Michael, and also the festival of the consecration of the church. And it came to pass after the Communion that the Bishop, and the governor, and all the multitude went together into the city to the temple of Zeus, and they burnt it with fire; and the dumb fiend which was in the statue cried out, saying, “Thou inflictest great pain upon me, O John, for thou hast cast me out of my dwellingplace.” And the governor caused a large church to be built on the spot where the temple had stood, and he dedicated it to the name of the Apostles; and Saint John confirmed everyone in the faith, and everyone praised him. When the Emperor Constantine heard concerning the good deeds which John was doing, he glorified God and he wrote to John a letter in which he besought him to bless him and his empire, and called him a new Daniel the destroyer of idols; and the whole country of Entias grew daily in doctrine all the days of Saint John, through the multitude of the miracles which God wrought bv his hand. Ye see, then, O my beloved, the power of God and loving-kindness of the holy Archangel Michael. In the growth of all the seeds of the field we find the entreaty of Michael, and through the prayers of Michael trees bear fruit. In the ships, whether they be sailing the sea, or anchored in port we find the entreaty of Michael. In the ascetics who live in the mountains we find the entreaty of Michael, and he giveth them strength to live their ascetic life. In the assembly of the monks we had the entreaty of Michael, who is a peacemaker in their midst. In the prayers of the Bishops, and elders and deacons at the altar we find the entreaty of Michael with the sick we find the entreaty of Michael, who giveth them strength, and healeth them. We find the entreaty of Michael with those who are afflicted at the tribunal and he becometh their helper. We find the entreaty of Michael the Archangel with those who are suffering punishment, and he becometh their helper. In short, to those who live he giveth strength in their time of need, and for those who are dead, he prayeth God to shew mercy unto them. Who is there among all the righteous unto whom the Archangel Michael did not go, and to whom he did not give strength in all his times of need? Among the martyrs who is there unto whom the Archangel Michael did not go and deliver out of all his affliction and torture, and give strength? And behold, O my beloved, we know the love of God towards man, and we know the prayers of the Archangel Michael, who hath become an ambassador for all mankind, for whom he prayeth to God the Father that He may shew mercy unto them all, and make their paths straight, and let us give unto him the things which he desireth, that he may bestir himself for us on account of them, and that he may love us exceedingly, and may pray to God for us. Let us love each other in the love of God, and let us live in the unity of brotherly love, and let no slander be upon our lips, for slander is a poisoned dart. Fornication is a stinking sin, and one which is greatly hated by God and His angels, and it is the poverty and death of the soul and of the body. Fornication is the friend of the Devil, it is the enemy of God and His angels, it is hated of Christians, and it is the friend of vain-glory. And now, my children, let us put away from us all impure ways, and let us walk in the straight paths of virtue; let us walk in sinlessness and in unspottedness, for a pure marriage never polluteth a man. Consider Moses, who spake with God five hundred and seventy- times, for he had a wife and children, and these prevented him not from ministering in the Holy of Holies. But let us not multiply our words overmuch concerning these things, for the testimony of the things which are old and of those which are new sufficeth us; and finally let us end our discourse and come to him whose festival we celebrate this day, the holy Archangel Michael. This festival to-day hath not need of the money of him that eateth, and drinketh and rejoiceth, and is glad by himself, while he leaveth the poor, and the orphan, and the widow hungry and thirsty. This festival hath no need of thy money, O thou who deckest thyself in an abundance of rich apparel, while the poor man naked perisheth with cold at thy gate. This festival hath no need of the money of those men who live at ease in their decorated houses, while the poor man perisheth with cold in the open spaces of the village. This festival hath no need of the money of anyone who eateth and maketh merry while the poor man lieth in affliction in prison. This festival hath no need of the man who maketh himself glad while the poor man lieth sick and unvisited. The commandments are not of man, but of God, and God gave to the race of man the commandments which are written in the Gospels. And finally, my brethren, with an upright heart let us beseech the Archangel Michael to obtain pardon for us from God, and I say that the whole world standeth through the prayers of Michael, and through the prayers of the Holy Virgin, the God-bearer Mary; therefore let us ascribe unto them the glory which is their due on this festival, for the time hath come when we must go to celebrate the Holy Mysteries. And let us ascnbe glory unto Him, to Whom all glory is due, our Lord and God, and Saviour, Jesus Christ, through Whom and with Whom all glory, and honour, and adoration are due to the Father, and to the life-giving and consubstantial Holy Spirit with Him, now and always and for ever and ever. Amen.